Hello! 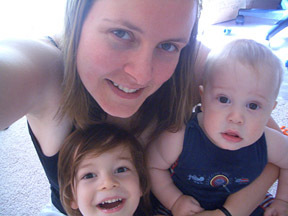 I'm Julie, and I am a a Seattle-area mother of two beautiful boys: Justin born in June '02, and Evan, born at home July '05. My wonderful hubby Chad works as a software developer, though he's much more interesting and dynamic than that sounds. In our family, we practice Attachment Parenting as well as a host of other things that AP parents are often associated with: natural birth/homebirthing, breastfeeding/child-led weaning, cloth diapering, non-/selective vaccinating, babywearing, cosleeping/family bed, gentle/positive discipline. The boys and I are vegetarian (I'm nearly vegan, I'm just not strict about it...which means I'm LAZY!) and while Chad is happy to be an omnivore he's supportive of my choices and eats vegetarian while he's at home. We also try to eat organically grown foods and avoid packaged junk, but we're far from perfect. I'm going to be homeschooling the boys for a while to see how it goes for us, and I am really excited to have the opportunity to do so. Prior to becoming a mother, I was employed doing a variety of things including pulling espresso, vehicle courier, office manager, and licensed massage therapy in a day spa. In addition to watching my beautiful sons learn about their world, I enjoy cooking, reading, gardening and anything outdoors, and wasting time on the web. I am a big-time breastfeeding advocate, and someday intend to get some additional schooling and be employed in the field where I can help breastfeeding moms get started and have successful breastfeeding relationships. Additionally, I am Chapter Leader for a local chapter of Holistic Moms Network which is a national non-profit organization which connects parents interested in natural health, attachment parenting, and the like. For a few years I had a home party business with Natural Family Boutique; the company has since closed its doors so if you were coming here to shop through my site, I appreciate it but you'll have to shop elsewhere. What else...oh, I do have a MySpace and a Facebook page if you're dying to see more photos of my kiddos and learn other thrilling details about me. Thanks for stopping by -- sign my guestbook if you'd like so I'll know you were here! If you'd rather, you can also send email.